For some strange reason, I've been having a lot of fond memories lately of Shattuck Avenue in Berkeley, California. In 2001, I moved to the Napa Valley to experience the harvest and eventually settled in San Francisco for three years to work for a wine retailer. My friends kept telling me about a wonderful-sounding place called the Gourmet Ghetto, and I'm fairly sure I took BART to Berkeley on one of my first days off to see it for myself. North Shattuck quickly became my preferred weekend spot to luxuriate, and only now do I realize how influential these excursions through the Trans-Bay Tube were for me. Chez Panisse sparked my interest in Slow Food, Cheeseboard changed the way I think about pizza, and Peet's Coffee became an obsession. All of that time I spent hanging around the original Peet's on Walnut and Vine made me fanatical about roasting, brewing, and generally all things coffee. I eventually moved on to the other-worldly coffee of cult roaster James Freeman and his superb Blue Bottle Coffee, and later discovered Ritual. But I credit Alfred Peet and the North Berkeley store for making me a lifelong coffee enthusiast. After San Francisco, I spent three years in Chicago, followed by another two in Boulder, Colorado. With each move, I became anxious about finding a roaster or barista on par with those I'd found earlier, but with every move, I have found excellent roasters and baristas. In Chicago I discovered Intelligentsia, a roaster par excellence with Peet's ties. And In Boulder I found that the religion of the Synesso reigns supreme, and Conscious Coffee taught me the details of crafting a perfect espresso. Obviously, my anxiety arose again when I decided to return to my home state of Nebraska with every intention of building a Gourmet Ghetto to call our own. My fear has once again proven to be unfounded with the discovery of Jon Ferguson and his top-notch brigade of baristas at Cultiva Coffee and Café Indigo in Lincoln. I first heard of Jon Ferguson and Cultiva while living in Boulder, while flipping through an issue of Imbibe magazine and landing on an article entitled "Coffee's Lone Rangers." 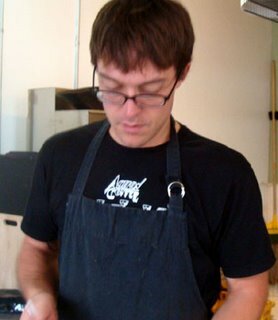 This is where I learned of Jon's experience as a barista with Seattle's Zoka Coffee and his roasting stint with Blue Bottle, names that jump off of the page for coffee enthusiasts. I immediately picked up the phone and began ordering and drinking Cultiva's coffee in Boulder, and after many cuppings and way too many espressos to count with my friends at Conscious Coffee, we collectively decided that Cultiva was on par with some of the best roasting in the country. 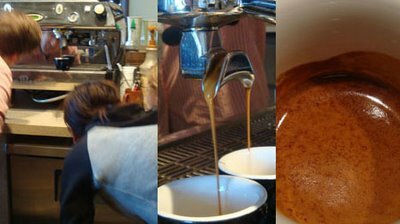 I am extremely happy that the baristas of Cultiva are equally skilled, and I am pleased to introduce them to you in this piece as we deconstruct the elements of the perfect shot of espresso. One of the baristas at Cultiva Coffee in Lincoln is Ian McCarthy, who arrived in Lincoln via Chicago via Portsmouth, New Hampshire. 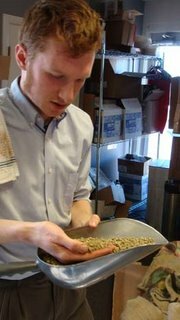 He trained with Metropolis in Chicago and Black Bear Micro Roastery in Portsmouth. In the eight years I have paid attention to the world of coffee and chatted with baristas across the world, drinking espresso in places as far flung as Cremcaffé in Trieste and Monmouth in London, I have never encountered a more thoughtful and engaging coffee professional than Ian. While Ian posses the skills to pull a world-class shot of espresso, his true passion lies in roasting, and he seems truly in his element behind the Diedrich IR-12 small-batch roaster which Jon acquired from David Schomer's Vivace Roasteria in Seattle. Schomer, whom the Seattle Times has dubbed a "coffee prophet" and is seen by many in the coffee trade as a guru-like figure, is credited with perfecting espresso in America and is certainly a key figure in the influential Seattle school of coffee. At Cultiva, the Diedrich Roaster still has a Vivace decal on it, which makes me smile every time I walk into the store. Ian says that "it's like having Schomer looking over my shoulder with every batch I roast," which puts extra pressure on him to get it right every time. Ian walked me through the entire roasting process for a small batch of espresso slotted for The Boiler Room restaurant in Omaha. "Seasonality" is a buzzword in restaurants across America these days, and I was very pleased that Ian started our conversation with an explanation of the seasonality of coffee. "Seasonality is the nature of agricultural products. This, in my opinion, is cause for celebration. Getting retailers and consumers to appreciate coffee as an agricultural product is an uphill battle. Someday soon, coffee lovers will sit impatiently, twiddling their thumbs, waiting for fresh Yirgacheffe in December, not unlike Beaujolais Nouveau in November, [and] first-flush Darjeeling in April." Ian went on to explain that variation in espresso blends is to be expected and welcomed with open arms. "Flavors will change drastically throughout the year. New seasons and crops mean completely different coffees from the year before". This means that Cultiva avoids any attempt at producing homogenized blends that taste the same to consumers year-round. "[That] would be costly, difficult, and an injustice to the farmers. If I taste something great, that I want to highlight in the espresso, then I will find coffees to complement it." A standard espresso roast is typically made up of coffees from several origins with coffees from Brazil commonly being a major constituent. Currently, Cultiva's Eco! Espresso is made from two parts Brazil, two Parts Mexican Chiapas, one part Ethiopian Sidamo and one part Sumatra. Each of these coffees possesses unique characteristics which they impart to the whole. This is not unlike the blending of Bordeaux, where Cabernet Sauvignon gives the wine its structure, Merlot its texture, and Cabernet Franc its aromatic complexity. These coffees are blended together and roasted for 15 minutes to the "second crack," which is an actual cracking sound heard inside the roaster which indicates a certain desired stage in the roasting process. Importantly, the freshly roasted coffee is then allowed to rest for at least three days, allowing gas to dissipate. A typical roasting batch is five pounds, which some may consider a small order, but this is the preferred batch size for Cultiva, where coffee is roasted in smaller amounts but more frequently. Tamara Vigil's family owns the Da Buzz coffee shop in North Platte, Nebraska, where she started pulling shots of espresso in 2002. Tamara was working as a coffee specialist with Whole Foods in Omaha when she heard that a new roaster had arrived in Lincoln. After attending one of Cultiva's roasting classes, Tamara made the move to Lincoln. The result was Nebraska's best barista joining Nebraska's best roaster. Tamara is now the manager at Café Indigo in Lincoln's Haymarket, which is a partnership between Cultiva Coffee and Indigo Bridge Books. 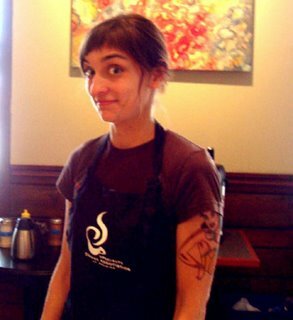 Tamara is a United States Barista Championship Certified Judge, and has been a professional barista for seven years. Being the coffee nut that I am, I spent a few days working with Tamara behind the bar at Café Indigo, soaking up as much information as I could about my second-favorite beverage. Indigo is equipped with what is probably the best espresso gear in the state, including their awesome La Marzocco GB5 espresso machine and a couple of sweet Mazzer Super Jolly burr grinders. Burr grinders or burr mills are the only way to get a consistent grind and are an absolutely essential investment for the coffee enthusiast. The common propeller-blade grinders cut the coffee beans unevenly, resulting in an inconsistent brew. 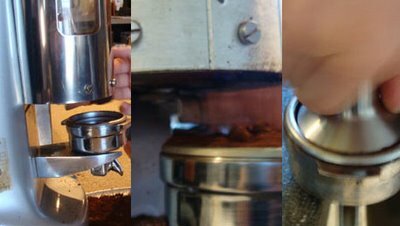 These grinders can also heat up the grind, causing a burnt and bitter taste, so it's best to demote that blade grinder to spices and herbs and instead use a burr grinder for your coffee grinding needs. I learned from Tamara that the fineness of the grind is adjusted daily, if not hourly, due to a number of factors, including humidity and atmospheric pressure. Also, I learned that most experienced baristas will have their grind and portafilters (the baskets that hold the coffee) set up for doubles. Ordering a single shot of espresso will most likely mean that the barista will actually make a double and discard half of the shot, rather than changing their grind and portafilter setup. Thus, to maximize your espresso experience, you should always order a double, which is what the best baristas are typically prepared to make. It's important that the portafilter is filled completely and evenly. The coffee should mound up and look almost overfilled, which is then pushed back and forth with the flat part of the index finger. This is one of the keys in preventing "channeling," literally the creation of little channels that form in the compacted puck where water rushes through uneven extraction. A double-shot portafilter will hold 18-22 grams of coffee, resulting in a 1.5-2.0 oz. shot of espresso (even less in a ristretto). Next, the tamper (another piece of equipment which can't be skimpped on) is held so that it is aligned with the arm, and is gently placed on top of the coffee before applying approximately 30 lbs. of pressure. This is another crucial moment in achieving a balanced shot as the barista must take great care in applying this pressure evenly. If the resulting coffee puck has even the slightest slant, the water will rush to the lowest part of the puck, resulting in uneven extraction. If all has gone well, it is time to pull the shot. Omaha native Dallas Fowler is one of the barista-world's rising stars. Recently competing in the Midwest Regional Barista Championships in St-Louis, Missouri, Fowler impressed the judges with her performance, displaying her excellence in preparing espresso drinks, her knowledge of coffee, her professionalism, and her presence. 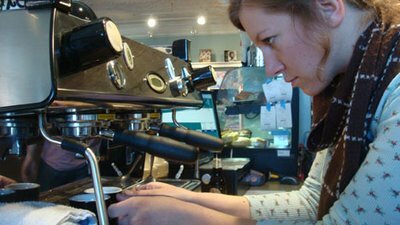 Dallas has her eyes set on the USBC next year and will be honing her skills in the meantime with Café Indigo. Perhaps nothing is scrutinized more closely by USBC judges than the actual shot itself, where the selection of coffee beans, roasting skills, grinding, and tamping could all be for not if the barista over- or under-extracts the espresso shot. The barista must so attentively monitor the shot that it is a wonder that espresso drinkers ever get a perfect espresso during the intense morning rush. 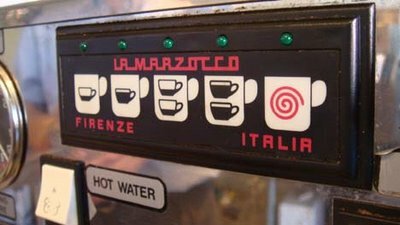 Never mind the one- or two-shot buttons on the espresso machines. Almost all quality-minded baristas prefer to pull their shots manually. Close attention must be paid to the speed at which the espresso is extruded from the portafilter. The all-important color should display tiger-like stripes, resulting in a thick and persistent crema, a deep golden-brown color, and noticeable speckled foam (noticeably so with the Cultiva espresso roasts). This is the moment of truth where the coffee is extracted at approximately 199 to 201 degrees for 25 to 28 seconds, resulting in an espresso that tastes almost sweet rather than bitter, and rich rather than acidic, with balanced flavors like a chocolate-covered cherry. Great espresso lingers on the palate for twenty minutes or more. Great espresso gives us many of the same sensory pleasure as a great glass of wine. When one considers the cost of an espresso versus, say a great Barbaresco, it's no wonder that Italians regularly drop everything for sixty seconds to enjoy "una bella tazza di caffe", a beautiful cup of coffee.